This Copic colouring was crazy fun & so fast! I can't share the card yet, since it's for an upcoming thingy... but I just couldn't wait to share this new (weird--but kind of nifty) Copic technique. --->Copics on gesso start off a teeny bit tacky to the touch (like when you colour metal with them) but they'll dry really nicely in a minute. ...even onto patterned paper or digital paper. (I like gesso on the back of glossy cardstock, since it curls less, but you can always stick it under a book to flatten.) 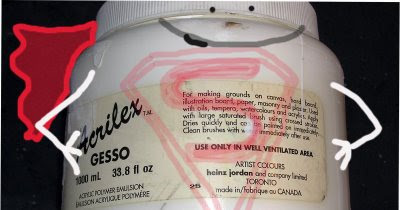 The gesso brand I truly prefer is made by Kroma, but most brands seem to be comparable. You can make your gesso cardstock smooth & consistent. I like a bit of texture. Step 2) Stamp with the ink you use with Copics or print an image out (some inks may need heat setting or embossing with clear embossing powder, since the gesso resists) Which can be a neat feature since you can emboss even dye-based inks this way! Where some of the paper has no gesso, you can get darker areas of colour (like at the bottom of the background on this image) since the blank spots with no gesso don't resist the copic ink. No Copics? This works with any markers (Stampin' up ones need embossing or they can smudge but that is cool too. You can also emboss Tombow markers.) Close to my Heart markers dry really quickly & nicely on the gesso, but can be manipulated with water for cool effects. OR over patterned papers...book pages...fabrics...so that you can layer over those designs with stamping (or printing on your computer and embossing it) and then colour with Copic markers. *Please know that gesso needs prep & prompt clean up; however, I find that it is worth it for the amazing things it can do. Protecting your work areas and cleaning tools right away is a really good idea. It's an acrylic primer so it has lots of staying power. It will clean off of most nonporous things though :O) A dedicated gesso brush is a cool thing (so your best brushes stay nice.) Gesso will stay on some surfaces if left to dry. ETA: Some gesso may come off on your Copics, so maybe test some if you're concerned about that? *Printing on gesso may not be for expensive printers. Mine was $45.00 so I go wild. Haven't gotten sick of my past gesso rambling? Curious maybe? This is really cool! I'm going to have to try this one for sure!!! Mel you are never boring. Must get some of this gesso stuff - it sounds great. This is SO super cool, lady! LOVE your techniques and what a score to find that it erases!!! I look so forward to your posts! No only are they creative but they are truly fun to read. oh, I bet whatever you are making is beautiful! Your sneak peek is super! I onoly recently stumbled on your blog. Great source of information and inspiration! Thanks. If you are starting a GESSO CULT I am first in line. I just love this stuff and have been using it for years. I just love mediums. I love mess too. Am I your Mother-we are very much alike. LOL.Thanks for your inspiring work again. That is an awesome technique, Mel! Thank you for sharing!!! all your tutorials are awesome! My goodness you can do so much! Hey Mel! You always come up with fun techniques!! How cool. . .you must have a stamping lab over there where you live. . .coming up with all those cool and creative tecniques! I love it. I have a lot of gesso. I may have to try this out. My Copics are running out of ink so it would be a great idea to conserve. .LOL! !